Have I been stalking this guy? Isn’t that my job to stalk musicians? 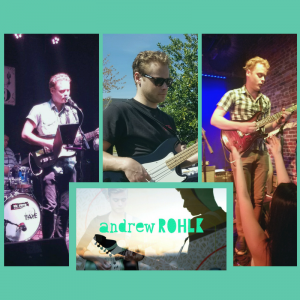 Well, Andrew Rohlk has been “Found” crossing my path since early 2016…or at least that is when I started grabbing pictures of him playing around town. I couldn’t resist his passion for that guitar of his; best guitar faces around…check them out on his Instagram. You may have been lucky enough to stumble upon him playing his hits along with some funky covers at The Camel, Carytown Coffee, Capital Ale House and a pile of other Virginia events and locations. It actually took me a long time to carry on a conversation with him…his talent is a little intimidating. A talent that has been in hiding but not “Lost” while sharing his love of music with the students of School of Rock Short Pump and Midlothian. His love of music shows in many of the students that he has encountered over the past five years. 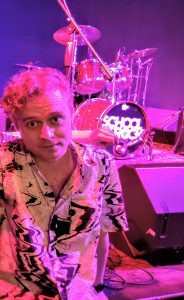 As a teacher, music director, show director and house band coordinator for School of Rock RVA he has well established his ability to stir up an audience and manage a band. He has watched many of his students go on to be successful musicians, supporting them even after they have graduated the school program. Many would say he is the reason some took the plunge into the music business full time. Now it is his turn. Rohlk is ready to give up all that gives us security as Americans and live his dreams. The last EP he released (now on Spotify) was five years ago…but he has been “Found”. And this Tuesday he will start dropping singles from his 2018 album “Lost and Found”. A series of songs about feeling lost and another set about being found. What a perfect name for a comeback album. So wait for it…there will be a band in the near future roaming RVA led by this expressive guitarist. His vocals are nothing to frown upon either. Do you like Prince? Well a little bit of Prince and a whole lot of Andrew make for a controlled and dynamic vocal presentation. 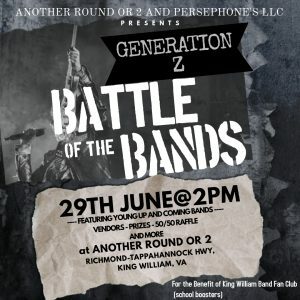 He is a musician’s musician no more…look for him around RVA and beyond this year. Head over to Spotify and check out his previous EP and wait anxiously for the release of his single on 5/22/2018 followed by rest of the album. And if you ever have a chance to catch Rohlk live…you should. Especially if you enjoy the sounds of blues…funk…indie…Americana…and dork rock!